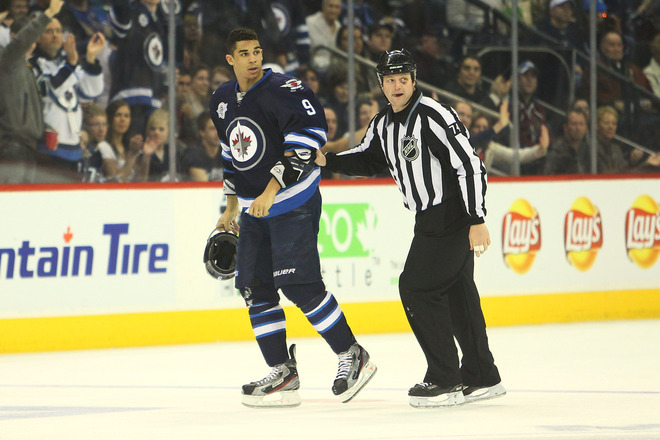 Evander Kane's 30 goals was a career high for the Jets budding star winger. If you are an impatient Jets fan that's your first reaction to the six-year, $31.5 million contract that 21 year-old Evander Kane finally signed late Saturday. My first reaction was of sheer joy and then of even more sheer joy after hearing his press conference after signing. Not only is he committed to becoming better and being a part of the Jets long term, there is no reason for him to not become a better player than he already is. If he is still improving, 30 goals is only a stepping stone to his progress as the Jets premier power forward scoring machine. Hold the phone though, why did it take this long? Was it length of contract? Was there hesitation on his part? While negotiations were on-going between Jets brass and Kane's agent back in July, there was hope for optimism at that point that quickly died out leading into a stretched out August of back and forth with the NHL and NHLPA squawking at each other. As a fan, I was worried that Kane would have too big of an ego to take such a base salary that the likes of John Tavares and Jeff Skinner had gotten earlier in the summer. Kane wasn't afraid to drop the gloves on occasion. While at the same time know that both Tavares and Skinner have accomplished much more in their careers than Kane - both have been All-Stars and both were nominated for a Calder Trophy which Skinner won in 2011. My biggest concern was he was reacting negatively to the Jets fans after what was a roller coaster season for Kane on and off the ice. Whatever was the case for his late signing was put aside in my mind and should put other fans minds at rest - Kane chose a six-year deal for a reason: he wants to be here. If Kane didn't want to be in Winnipeg as a Jet, he would have either not signed and waited for an offer sheet of some kind or signed a short-term deal to be able to become a UFA sooner and make money elsewhere. And that, in my mind, shows that Kane is progressing, not only as a hockey player, but as a professional. And for our leading goal scorer, that's the most positive sign for the Jets future.